A 3D board game published by Denys Fisher in 1975, which was originally based on the US board game "Which Witch". This is the 2nd edition of this game published by Denys Fisher, hence the title being "New Haunted House". 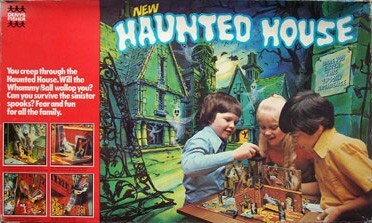 The 1st edition of this game was published in 1971 and called simply "Haunted House". The object of the game is to be the first player to travel through the Haunted House and reach the charmed circle at the top of the stairs, but there are lots of dangers along the way to catch you out, when the metal ball is dropped down the chimney. The game play is identical to the 1971 1st edition of Haunted House. The parts are very similar to the 1st edition of Haunted House, but you will notice that the names of the cards have changed. Ghoulish Gerty has become Ghastly Arthur, Glenda the Good has become the Friendly Soul and Wanda the Wicked has become Evil Dr. Creek. You also get a rules and assembly instructions leaflet with this edition, instead of them being written on the inside of the box lid. There are 1-2 other minor changes as well. Price: From £75 plus postage.